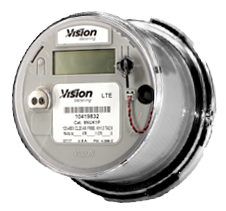 The XT-UL Platform is the “fully-loaded” kWh meter offered by Vision. In addition to having all of the standard features of the ST platform, it also provides in-the-field Demand reads and it is compatible with multiple AMI solutions. This meter is ideal for systems utilizing kV billing or in need of a low-cost smart metering solution. Both Class 100 and Class 200 switches can be included in the base of either package. Class 200 switches are available in forms 1S, 2S, & 12S, while Class 100 switches are available in Forms 1S, 2S, 12S and 16S meters. Additional functionality includes four quadrant metering for KWh and KVARh along with the ability to output VARh pulses for testing. The Vision 20/20 programming software has also been upgraded to provide programming of all new features. The smaller package can be used for Forms 1S, 2S, 3S, 4S & 12S while the larger package can be used for all meter forms. All materials used in the production of the XT-E are UL listed and are the same as those found in our UL listed meters. As with the Vision XT platform, TOU, Load Profile, Demand, Reactive, Net Metering and Four Quadrant Metering are all included at no additional cost. The Vision XT-UL meter was designed to accommodate powerful AMI modules.